The holidays are coming up, so I wanted to pass along a couple healthy holiday vegan recipes that you can take with you to share with your friends and family at your next holiday gathering! *You can find lucuma powder on Amazon.com or you can substitute it with a splash of vanilla extract. Place all ingredients (except the apples) into a high speed blender and blend until smooth and creamy. Slice your apples and dip as needed. Finely chop the cabbage in a food processor and place into a mixing bowl. Finely chop the apples in the food processor and add to the mixing bowl. Finely chop the fennel in the food processor and add to the mixing bowl. Finely chop the cilantro in the food processor and add to the mixing bowl. Add the lemon juice and cranberries to the mixture and thoroughly mix all ingredients. Use a julienne peeler to slice the outside layer of the red bell pepper and place in a bowl. Add remaining red bell pepper, green onion and dill to the food processor and pulse till chopped. Using a potato peeler, slice the cucumber length-wise into long thin strips. Add a thin layer of your guacamole mixture to each cucumber strip. 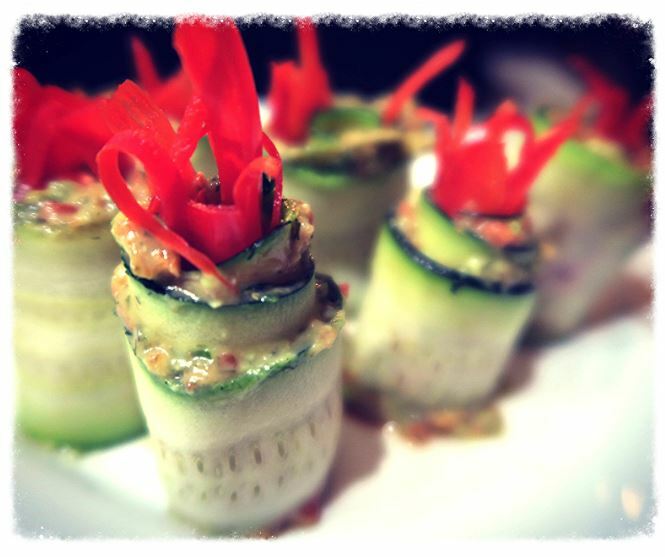 Add a few red pepper strips to the left end of your cucumber strip. Starting from the left side, roll your strips gently until you reach the end of the cucumber strip. If you make any of these recipes, please let me know what you think!